18:30 - 21:30 for dinner. 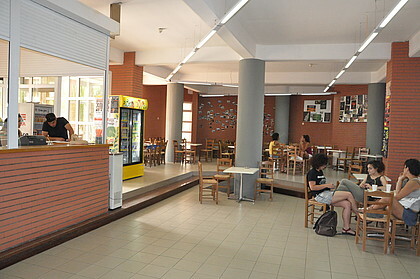 Students may have meals for free at the University Restaurant provided that they fulfil certain financial and social requirements with regard to their personal or family status and that they apply to the Directorate of Academic Affairs. A considerable number of undergraduate and postgraduate students as well as Erasmus students have free meals while the rest of the students have meals at extremely low prices. In the current academic year, students who are not entitled to free meals, pay 0,99€ for breakfast, 2,85€ for lunch and 2,22€ for dinner, per day. Students may also take their meals in packages if they wish for no extra charge. Apart from students, University personnel (faculty members, administrative employees) and visitors very often choose the university Restaurant for their meals, paying the same prices as mentioned above, per meal (it includes main course, salad, cheese, dessert). Three cafeterias are open daily for snacks, coffee and refreshments or/and for relaxation and meetings with friends.